"I enjoy the taste of meat cooked in this pan. It has the wonderful flavor of food evenly cooked in cast iron. 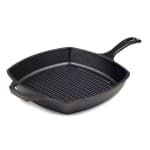 I have several other cast iron pa..."
"I enjoy the taste of meat cooked in this pan. It has the wonderful flavor of food evenly cooked in cast iron. I have several other cast iron pans, but this one has the grill marks and food doesn't remain in the fat. Provides great taste and cooks evenly."